The stylish, stainless steel probe, longer lead, box design, convenient storage, built-in bracket, a wide temperature range suitable for industrial, agricultural, refrigeration and air conditioning. Designed for temperature measurement of air, liquids and soft bodies - inside rooms. -Unit selection: Celsius (C) or Fahrenheit (F) degrees. 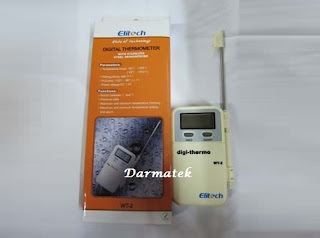 -Minimum and maximum measurement function of temperature measurement. -Alarm function after exceeding a programmed minimum and maximum temperature. -Scope of temperature measurement: -50C - +300C (-58F - +572F). -Possibility of hanging on a wall, fastening with a clip or setting on a flat surface. -Power supply: 1 battery (AAA, IEC LR3, DC 1.5 V).